Hungry all the time, even after meals? The most filling foods contain certain key nutrients that will have you feeling satiated. Any list of the most filling foods will include the good ol' apple. 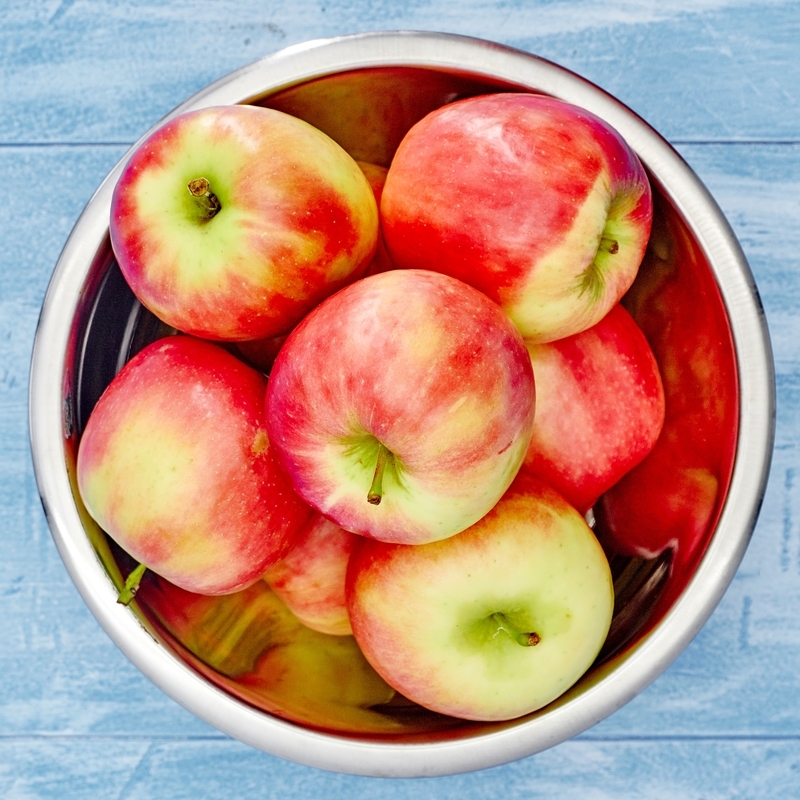 Keep a bowl on hand; the fiber in this popular fruit helps control our hunger. Achieving and maintaining a healthy weight goal can be a constant struggle, particularly if you’re hungry all the time. You may feel constant cravings for sweets between meals or for your favorite junk foods in the afternoon and late at night. First step in controlling those cravings: Choose the most filling foods at meal time—and in portions that are appropriate for you. And, of course, you’ll want those “most filling foods” to be nourishing. The right choices have multiple benefits, among them an ability to curb hunger and subdue the desire to eat more at subsequent meals. For many individuals, food can be an ongoing love-hate relationship. Misguided eating habits have contributed to a $60 billion weight loss industry, according to data collected and analyzed by Marketdata Enterprises. If you feel hungry more often than you should, or if you struggle with eating in excess (the wrong foods, the wrong quantities, or both), it’s not all doom and gloom. Bad habits can be broken, and you can adopt new approaches to eating. A better understanding of your need for food can help you make better choices. The feeling of hunger is the result of complex interactions between your brain and your digestive system. Hunger is essentially your body’s response to consuming less food than you normally do. Your brain detects hormonal and nutrient changes in your blood, which in turn causes feelings of hunger. Our reaction drives us to eat the wrong foods or more food than we actually need. The impulsive among us are quick to grab the first treat we see. Several hormones influence your hunger. Leptin and ghrelin are examples of hormones that affect feelings of hunger and fullness. Leptin is released from your body’s fat stores and suppresses hunger, and ghrelin causes your stomach to growl—a physical shout out to let you know you’re hungry. There is often “resistance” to the hunger-suppressing effects of leptin in individuals who are obese. An oversupply of fat tissue leads to an oversupply of leptin, which in turn causes increased feelings of hunger. This is referred to as leptin resistance. Doing some planning around meals and snacks and being mindful of your cravings can be helpful in the fight to feel full. Make sure you’re drinking enough clean water throughout the day; we sometimes mistake a lack of hydration for hunger. Speaking of liquid and hydration, eating soup has been scientifically associated with feeling more full at mealtime. In fact, soup might just be one of the most filling foods. Enjoy your favorite hearty soups cooked with the ingredients discussed in this post to satisfy your hunger. Processed and refined foods, foods high in simple carbohydrates, and foods high in sugar (your basic junk foods!) typically lack important nutrients that help us to feel satisfied for longer periods of time. On the other hand, foods that have been shown to offer longer-lasting satiety include those high in fiber, protein, and healthy fats. Fiber actually triggers the release of certain hormones that help to make you feel full, and fiber-rich foods have many additional benefits. Choosing foods that support blood sugar balance is important in the quest to feeling full. Low GI (glycemic index) foods such as nuts, seeds, vegetables, and beans release energy slower than high-GI foods containing refined carbohydrates and sugar—those same old junk foods. As is the case with fiber-rich foods, low-GI foods also increase hormones that help you feel more full for longer stretches. 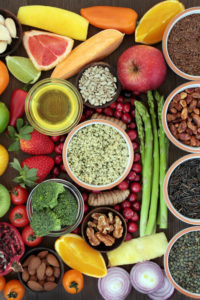 High-protein, nutrient-dense whole foods such as free-range eggs and poultry, wild-caught fish, lean grass-fed meats, and unsweetened Greek yogurt are examples of some of the most filling foods you’ll find. As always, be mindful of portion size when filling up on animal protein in order to keep saturated fat at bay. Consider incorporating plant-based whole foods into your diet that are also high in protein, such as organic soybeans (edamame), lentils, and beans. Unsaturated fat (further classified as monounsaturated and polyunsaturated) typically comes from plant sources. Examples of monounsaturated fat include olive oil and avocados. Examples of polyunsaturated fat include variety of nuts and seeds, such as peanuts, walnuts, sesame seeds and sunflower seeds. A study published in the British Journal of Nutrition showed obese women who paired moderate amounts of certain nuts or nut butter with their breakfast felt fuller for up to 12 hours after finishing breakfast compared to those who didn’t consume nut products. That’s a long time! Nuts and seeds are examples of omega-6 fatty acids. Also a source of unsaturated fat, omega-3 fatty acids are found in cold-water fish and seafood. We need a balance between omega-6 and omega-3 fatty acids in order to avoid the risk of developing inflammatory conditions. Nuts and seeds have a higher level of omega-6 fatty acids than omega-3 fatty acids, so don’t overdo it. The Institute of Medicine recommends that 20 to 35 percent of your total calorie intake should come from fat, making it important to consume healthy fats in moderation overall. High-fiber foods expand more in liquids, and as a result they take up more room in your stomach, helping you to feel fuller. Also, foods that contain fiber usually take longer to chew, which gives you time to feel more satisfied with less. Fiber might even contain an anti-appetite molecule. Hearty high-fiber vegetables provide a dense supply of vitamins, minerals and phytonutrients. Try all kinds of filling veggies, including cruciferous varieties, such as broccoli or cauliflower. Enjoy your produce raw, sautéed, grilled, baked, or roasted! Berries and other low glycemic fruits make good fiber-rich choices. Eat the skin where fiber is stored. Legumes, flaxseed, and chia seeds are also loaded with fiber. add, appetite, blood sugar, brain, breakfast, cauliflower, diet, digestive, eating habits, ed, fiber, fiber rich foods, food, food cravings, ghrelin, Glycemic index, good fiber, health, healthy fats, healthy weight, hydration, institute of medicine, leptin, leptin resistance, low gi, low gi foods, low glycemic fruits, metabolism, most filling foods, nutrients, nutrition, nuts, omega 3, omega 3 fatty acids, omega 6, organic, phytonutrients, polyunsaturated fat, protein, refined carbohydrates, simple carbohydrates, skin, smoothie, sugar, vegetables, vitamins, vitamins minerals, walnuts, yogurt.